"Hey guys, I bought a brand new 64GB USB flash drive with the purpose of carrying documents and other files between home and company. It was formatted to NTFS to store data, which was proved too slow. Recently it reports errors when it is connected to computer and yesterday it asked me to format it. So I tried to reformat it to FAT32. The problem is that formatting can't be performed successfully and gives error message 'Windows was unable to complete the format'. For the moment, the USB flash drive turns inaccessible and can't be formatted. I really need to be able to format it and make it normal to use, as it holds important documents. Any help will be greatly appreciated!" This is one of those frequently asked questions on many forums and question sites and this post will give detailed and overall explanation about this issue. USB flash drives or memory cards are useful storage devices in modern society, as they are capable of storing a large amount of data but occupying small physical space. USB flash drive is easy to carry and transfer data, and memory cards, with smaller size, have become essential component in various digital products such as digital camera, cell phone, MP3 player, etc. USB drives are important to users and it's necessary to learn skills and solve the problem. USB drives are very portable and they can be connected to computer easily via USB drive to backup or transfer data. Since they are often carried by users and might be used on various computers, USB drives are more likely to get damaged or infect virus. Every time you plug a USB drive into USB port of computer which is not protected by antivirus software such as public computers, USB drive will infect virus which often acts with a manner that fill USB drive with dangerous files and makes USB drive stop working. Storage devices have bad sectors. As we all know, storage devices consists of sectors which are the smallest unite for data storing. Files stored on hard drive or USB drive usually occupy discontinuous sectors. Bad sector means the sector is damaged and can't be read or written, thus bad sectors can disrupt the formatting operation as well as file recovery. There are quite a few causes of bad sector, like bad quality, excessive defragmentation, unplug USB drive directly while it is working, etc. Physical damage is another reason that makes storage device inaccessible. All components of USB drive or local disk can't escape physical damage. Computer won't be able to format the device if it can't use the device, such as chip or circuit board doesn't work. Professional repair center can replace damaged circuit and other damaged part to make it workable again. Whereas, the replacement process costs quite higher than the USB drive itself. Besides, Windows can't format a drive which is write-protected. When USB drive gets well connected to computer, you start to copy some documents to it, then it reports messages "The disk is write protected. Remove the write protection or use another disk." As formatting is a kind of writing operation, so you need to remove the write-protection before formatting it. You should note that all these solutions won't be workable if the USB drive gets badly physical damage. Thus there is no guarantee that these methods work on all scenarios. What's more, make sure that important data and files of the drive to be formatted have been backed up, as files will be erased once the drive is formatted. If USB drive became inaccessible before you had time to backup data, then you need to perform file recovery first prior to formatting. Steps of file recovery from damaged USB drive will be talked in next section of this post. Disk Management is provided by Windows and it helps to manage partitions and disks for computer. Disk Management is able to create new volume, extend or shrink partition, change drive letter, delete or format partition, etc. 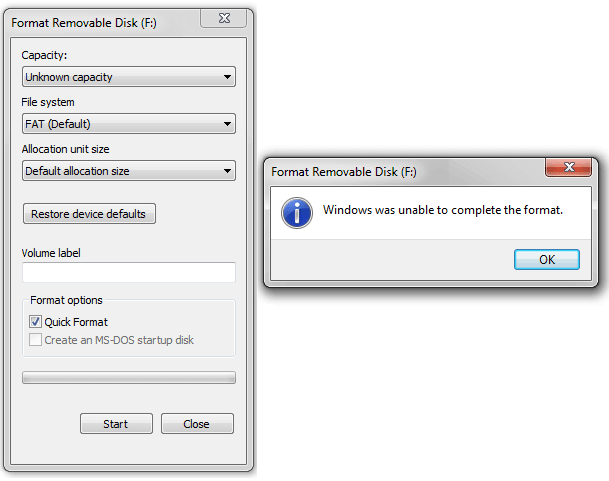 Damaged flash drives can be formatted within Disk Management. If USB drive uses unrecognized file system format or becomes unallocated or uninitialized, it will not show in My Computer or Windows Explorer. Thus it's not available to format the drive through right-click menu "Format" option. 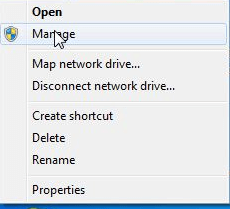 Open Disk Management. Right click on My Computer and select item "Manage", and then click Disk Management on the left side. In the center section you can see local hard drive and partitions and the USB drive which can be recognized by capacity. Right click the flash drive and select "Format" option and select file system format to perform quick format. However, this action is not workable in some cases, and you need to try step 3. Disk Management is not almighty and it is not helpful in many cases. Thus we need to switch to command line based formatting solution. It looks like this method is complicated to common users, but it is not. Follow steps below and see whether it can get everything done. For Windows 7 users click Start button and type cmd in the search both and press Enter. If UAC is enabled, you need to find Command Prompt from start menu and run it as administrator. Type command diskpart on the black windows and press Enter key. Then you can see partition and disk list of current computer. All drives are listed with numbers and Disk 4 is the flash drive in question. Continue typing disk 4 which is the problem drive and clean and press Enter. The drive will be scanned and its damaged file structure will be erased during scanning. Once the process is done, it reports confirmation message telling that it has successfully cleaned the drive, and new partition need to be created. Type create primary partition and hit Enter; next type in Command prompt format /FS:FAT32J: (you can copy and paste it.) and press Enter. Here J is the drive letter of the USB drive, and you can change it in line with specific cases. The drive will be formatted to FAT file system and the formatting is very fast. If the first two methods do not work as expected for you then try to fix the issue with third party tool PartitionGuru. It's effective disk tool and partition manager and file recovery tool, which can check and repair bad sectors for local and USB drive, format partition or HDD, recover formatted and deleted data, etc. As the Windows can't format USB drive issue might be caused by bad sectors, we can check and repair bad sector for flash drive with PartitionGuru ahead of trying formatting. Run PartitionGuru and see its main interface listing detailed information of internal and external drives and their partitions. 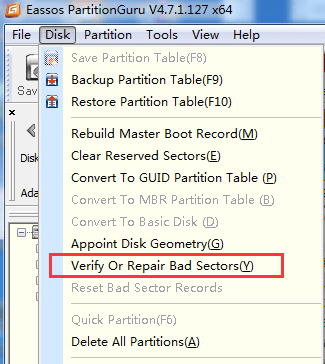 Click the problem USB drive and menu "Disk" to select "Verify or Repair Bad Sectors". It displays cylinder conditions with colored blocks, such as good, severe, damaged, etc. When bad sector checking completes, it reports how many bad sectors it finds out. Then click "Repair" button to repair bad sectors. Select the USB drive and click "Format" button to format the flash drive. Repairing bad sectors damages files stored on and near bad sectors, thus if files on the drive are important to you, you need to backup or recover data first. Such kind of problem is very common to those who often works with USB drive, and it might end up with losing all files and folders. However, you are able to recover lost data provided that USB devices are not totally dead. One thing you should keep in mind is that you might not be able to recover data completely if the drive is formatted or repaired. Thus file recovery should be performed first if the problem drive contains valuable files which haven't been backed up. Apart from checking and repairing bad sectors, PartitionGuru is able to recover lost files that are deleted, formatted, reformatted or corrupted from local or USB drives. File recovery process is read-only and doesn't do harm to original data and storage. Let's see how to recover files from USB drive. Connect the USB drive to computer and run PartitionGuru. Then you can see your USB flash drive or SD card is listed on the interface. Select and save desired files to a secure location. When file recovery completes, you can try methods mentioned to format or repair it. These are best methods to fix Windows was Unable to Complete the Format issue at present and most of times they work well. You can try these solutions above one after another and find the one works for you. If none of them works, then the USB drive might be damaged permanently and there is no way to fix it. How to fix "Windows detected a hard disk problem"
"I have been trying to format a flash disk but Windows can`t complete the procedure"
"Software is not working, when formatting via this software, "device is not ready: message is appeared." "Thank you very much...My usb has been saved,the software is really working and amazing." " It says you can recognize the usb drive by capacity. How?I have partition 1 8.26gb capacity, partition 3 450mb and windows c 457.06gb. I don't want to go changing things I don't know anything about unless i'm 100% sure. Great article by the way!" "Can you suggest a more invasive method, above methods, don't work for me." "Thanks a lot of. It's very Helpful and working 100%..."
"i cant read and write checking card in samsung mobile showing read/write wheni checking on pc all folders showing readonly when i check micro sd card on chkdsk showing cannot write boot sector how to fix it i do everything but can`t solve problem"
"Dear Support Team, Lot of thanks to all and I am using solution 1 method like disk management it is done and working well." "unable to format my flash desk"
"Thanks bro its work. Really thank you so much"